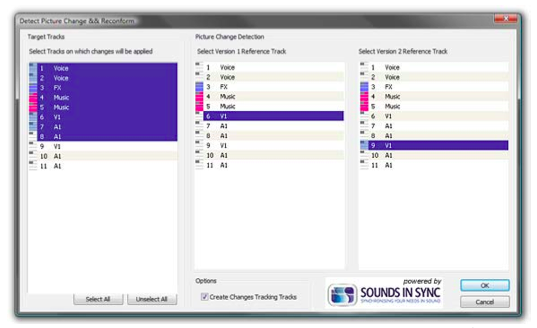 Since 2004 Sounds In Sync has been working with Merging Technologies to provide a re-conform solution within Pyramix. The result is the 'Detect Picture Change & Reconform' function that finds the difference between two vision tracks and then applies the changes found to one or more audio or vision tracks. This function comes with every standard Pyramix license (since version 6) and uses the same algorithm to compare edit lists as EdiLoad v3. If Change Lists need to be generated in EdiLoad, the EDLs exported from EdiLoad can be used to re-cut a Pyramix project via the 'Load Change EDL & Reconform' function.